Oceanology International (Oi), one the world’s foremost series of ocean science and technology events, will celebrate its 50th anniversary at Oceanology International Americas 2019 (OiA), which returns to the San Diego Convention Centre from 25- 27 February 2019. Following the successful inaugural event in February 2017, the biennial OiA conference and exhibition is once again organised in association with the Maritime Alliance and promises to deliver even more exhibitors and visitors alongside its perennially in-depth and tightly curated conference tracks. While the half-century milestone will be marked throughout OiA, a dedicated conference program covering the historical and technological advances that Oceanology International has played host to over the years will take place on the final day. This one-off event is free to attend and will run on the exhibition floor, with five hand-picked speakers representing each decade to be revealed soon. Launched in Brighton, UK, in 1969, at a time when the ocean industry was booming due to the newly-formed offshore oil and gas industry, Oi has since become recognised as the leading event series for diverse stakeholders from government, academic and research institutions to survey companies, technology developers and business leaders. In 1969, around 600 exhibitors and visitors attended from all over the world, including the Society for Underwater Technology (SUT), Oi’s first ever sponsor and still a vital partner today, with its latest position as Technical Programme sponsor at OiA. At the turn of the 21st century, a move to larger premises – ExCel London – gave the Oi franchise a substantially higher profile, larger exhibition space and an extensive dockside which has proved invaluable for exhibitors to demonstrate their latest developments. San Diego’s on-water facility is also proving popular with OiA exhibitors and delegates. The inception of Oi China in 2013 ushered in the energy of a thriving new marketplace, trading upon the country’s developing offshore energy and marine industries. A move from Shanghai to the ‘sailing city’ of Qingdao has since cemented Oi China’s pre-eminence, while the launch of OiA in 2017 engendered fresh stimulus while focusing on regional excellence, with an international outlook. The Oi conference has always attracted the biggest names in ocean science and technology, keen to share knowledge on new developments in their specialist fields. While the challenges of the day have diversified in the half-century since the start of Oi, the conference has always focused on the application of new methodology and technology, with contemporary focus veering towards enabling the safe and sustainable use of the ocean and protection of the marine environment. The three-day Technical Programme at OiA ’19 features technical tracks focusing on Observation and Sensing, Hydrography, Geophysics and Geotechnics, Unmanned Vehicles, Vessels and Robotics, Marine Pollution and Environmental Stressors, Navigation and Positioning, and Ocean ICT. The Oi conference has evolved significantly since 1969 with new focused events joining the Technical Tracks along the way. 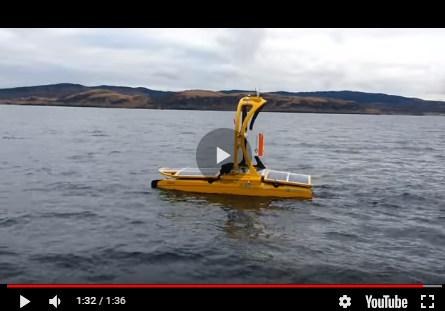 Catch the Next Wave (CTNW) was introduced in 2012, with a remit to discuss a longer-term view of the capabilities that are shaping our future ability to explore, understand, exploit and protect the oceans. Taking place on Tuesday 26 February in partnership with the Explorers Club, the OiA ‘19 edition of CTNW will investigate how technology enables exploration and how, in turn, exploration drives the development of new and novel technologies. The exclusive Ocean Futures Forum, a new part of the Oi family launched in 2018, will make its US debut at OiA. Taking place on Monday 25 February, this one-day conference and networking event brings together senior strategists and heads of business to hear and discuss the emerging requirements for technology across key offshore industries, offering compelling insights into the role of ocean science and technology in enabling the development of a sustainable Blue Economy. The free-to-attend exhibition has always been at the heart of Oi, acting as a high-tech meeting place for companies and organisations to highlight their latest developments to a professional audience. In 1969, the first Oceanology International hosted a total of 600 exhibitors and visitors, while Oi 2018 attracted 520 exhibitors from 33 countries and nearly 8,000 attendees to ExCeL, London, in March. At the San Diego Convention Centre in February, OiA ‘19 will host more than 200 exhibitors (up from 160 in 2017), from a variety of interrelated disciplines, ranging from subsea survey, maritime security and marine renewables to fisheries & aquaculture, digital technology and ocean mining.